Pinacolone is a colorless clear liquid which has C6H12O as chemical formula. 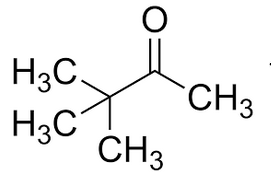 This substance is an unsymmetrical ketone and is used as intermediate in the production of pharmaceuticals and pesticides. Pinacolone is also known as 3,3-dimethylbutanone and tert-butyl methyl ketone. United States: We have regular sales of this substance, this product can be stocked upon request. In this case our delivery time is about 1 week. Canada, South America, South Africa and other markets can also be served, please contact our sales department for more details. We don’t supply this substance to EU customers. Pinacolone is mainly used in the production of triazole pesticides, such as triadimefon, paclobutrazol, uniconazole, metribuzin, etc. Further it finds its application in the production of pharmaceuticals. Special packaging is available on request. Store Pinacolone in a cool, dry and well-ventilated area and in line with legal requirements. A Material Safety Data Sheets (MSDS) is available for Pinacolone and all other products supplied by Vesta Chemicals BV. An MSDS describes the hazards of a product and explains how a product can be safely handled, used and stored. Besides it provides important regulatory and emergency response information for the purchased product. This substance (CAS: 75-97-8) will not be REACH registered by us. Pinacolone| CAS:75-97-8 | Disclaimer. This information is supplied solely for informational purposes and Vesta Intracon bv makes no guarantees or warranties, either expressed or implied, with respect to the accuracy and use of this data. All product warranties and guarantees shall be governed by the Standard Terms of Sale. Nothing in this document is legal advice or is a substitute for competent legal advice.